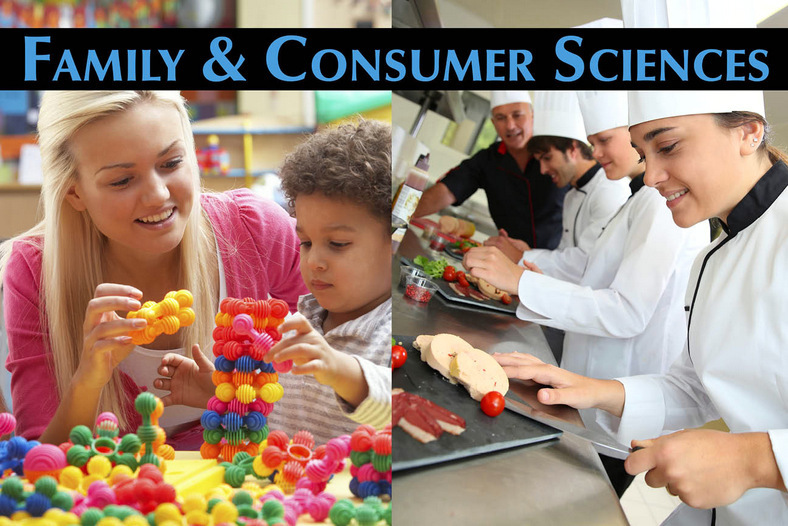 This course provides students the opportunity to develop essential skills in the various career pathways related to Family and Consumer Sciences (FACS). Students will explore and cultivate skills in food and nutrition sciences, childcare, interior design, clothing and textile construction, fashion design and merchandising, consumerism, entrepreneurship, family relationships, personal responsibility, and career and job-related tasks. This course will strengthen comprehension of concepts and standards outlined in Sciences, Technology, Engineering and Math (STEM) education. ​This course is designed to focus on the science of food and nutrition. Experiences will include food safety and sanitation, culinary technology, food preparation and dietary analysis to develop a healthy lifestyle with pathways to career readiness. Laboratory-based experiences strengthen comprehension of concepts and standards outlined in Sciences, Technology, Engineering and Math (STEM) education. Student leadership and competitive events (FCCLA) may be integrated into this course. This course explores how fashion influences everyday life and introduces students to the fashion industry. Topics covered include: fashion fundamentals, elements and principles of design, textiles, consumerism, and fashion related careers, with an emphasis on personal application. This course will strengthen comprehension of concepts and standards outlined in Sciences, Technology, Engineering and Math (STEM) education.